First off, I should clarify something. 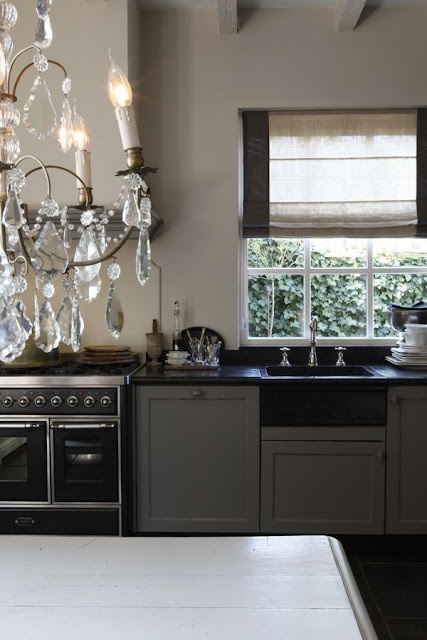 I'm definitely not a purist when it comes to using authentic vintage lighting in a kitchen. There are just so many wonderful reproductions out there but I do notice how my eye is always drawn to the real thing. That certain worn patina that can't be faked. The weightiness and look of real crystals. especially a white kitchen which depends on a mix of materials to keep it from being too 'cold' or modern for my taste. In my last house I had an old crystal chandelier that broke during our relocation. Even though it wasn't large enough for our high ceilings it sealed my love for sparkling chandeliers in the kitchen. I especially love them paired with rustic wood. The only problem was I hadn't been able to find a replacement for my broken one. but in the end, it seemed a bit too restrained for me. 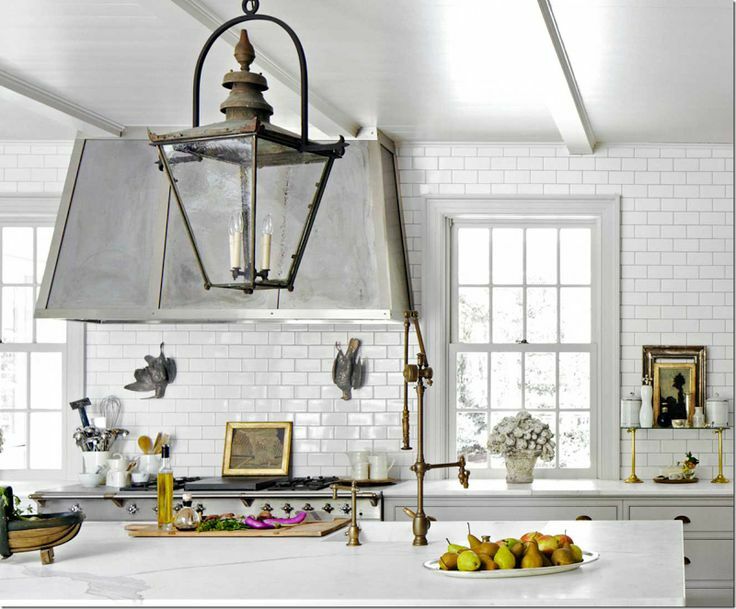 I started considering old, oversized lanterns like this one which I think looks gorgeous surrounded by marble countertops. 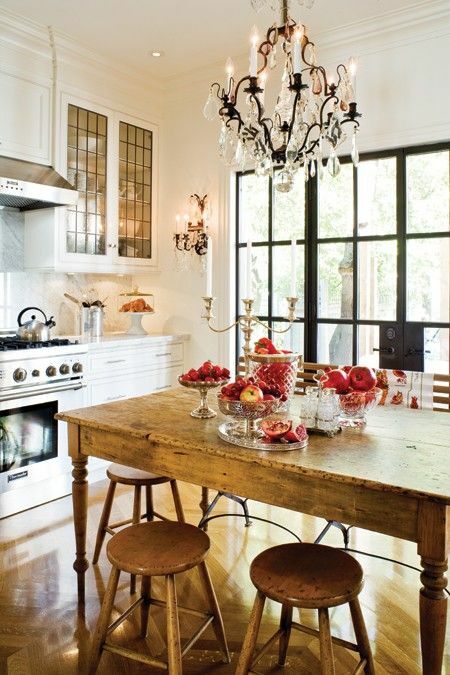 This kitchen was designed with the classic French bakery as inspiration and you can see more of this swoon-worthy house HERE. but I soon realized something. 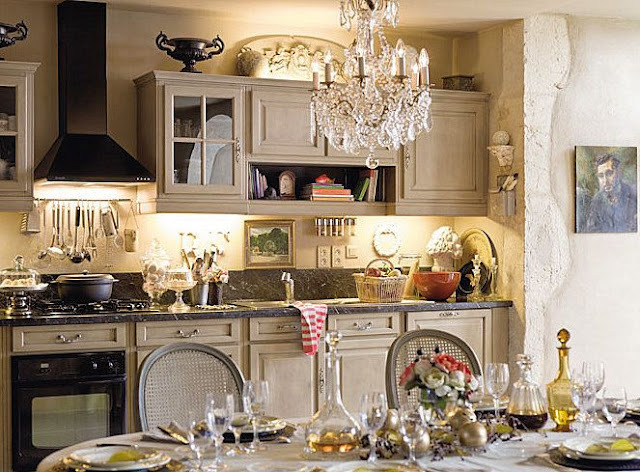 I realized that even though I have an affinity for quirky, eclectic pieces when it comes to my kitchen chandelier I kept coming back to classic choices. And what is it about authentic looking brass right now? but it's been calling my name lately. So I decided to keep an open mind when Mr. Moss and I went shopping for my Christmas gift last weekend. I'm not sure if this is a sign of a 27 year-old-marriage, but my favorite Christmas present was a handmade gift certificate for a afternoon of antique store shopping and lunch from none other than my Honey. I know! How did he know (I believe in hints) that making goo-goo eyes at lots of old chandeliers followed by a glass of wine and lunch next to the pier was my version of a dream date?! Also we found this chandelier at the first place we went. Should I be suspicious that he liked it so much? As you can see we bought an old, oversized brass fixture with crystals and lots of engraved detailing which you can't see in the photo. It was pretty close to an impulse buy and afterwards I had to check my IPhone picture to learn that it has ten lights... yes ten!! Which kinda made me worry about it's size. But now that it's home sitting on the table I'm feeling excited. We both agreed we selected it for our future kitchen which I'm slowly designing in my head. What do you think about using vintage lighting fixtures in your house? Your chandelier is so beautiful, Leslie! I'm looking forward to seeing how you use it! I love the look of old fixtures...I found three old chandeliers at a garage sale last year, and really want to use them in our home. Your inspiration photos inspire me! Great post to start off the year, Leslie! Like Sarah, first and foremost, what a sweet hubby. I love that he even made you a "gift certificate". I love anything that is authentic, often no matter how battered and beaten it is. There's so many great stores that can repair/rewire anything. I love the one you've found. It will forever be so special, in part thanks to a wonderful Christmas gift from your honey. Great patina and sparkle...can't wait to see it hung. Happy New Year, Leslie. What a perfect gift of an afternoon doing your favorite things. Your hubby is a keeper. The chandelier is a beauty! It looks almost identical to the one my husband and I bought at the market in Paris and now hangs in our bedroom. You will enjoy that piece tremendously. 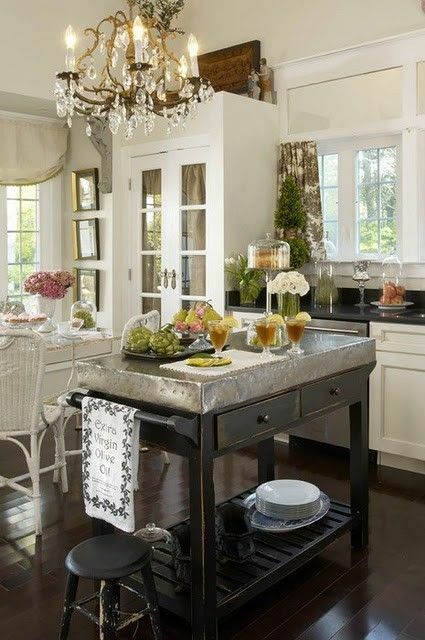 I'm all about using vintage chandeliers--even with a modern mix of furniture. I enjoyed your previous post as well and just linked to it in my most recent blog post--inspiring thoughts for the new year. followers know by chance where I can order it? P.S. Your "honey" sounds like a keeper! YOU are SPEAKING TO THE RIGHT DAME!I ONLY Use VINTAGE chandeliers........they are all over you could say I collect them! It will be a SMASH........BE certain the installer puts a dimmer on it.YOU will LOVE THAT! Only you could turn a hunt for a chandelier into a fabulous story and a date! I can't wait to see it hanging. We don't have any vintage lighting in the house and I wish I did. My sister has the lamps my grandfather made and I'm a bit jealous. it's a beauty, leslie! way to be patient and picky in order to get it right. it will be just perfect, adding so much feminity and history. we bought 6 vintage brass and crystal chandeliers and sconces for the cottage over the summer, and i love the aged patina. 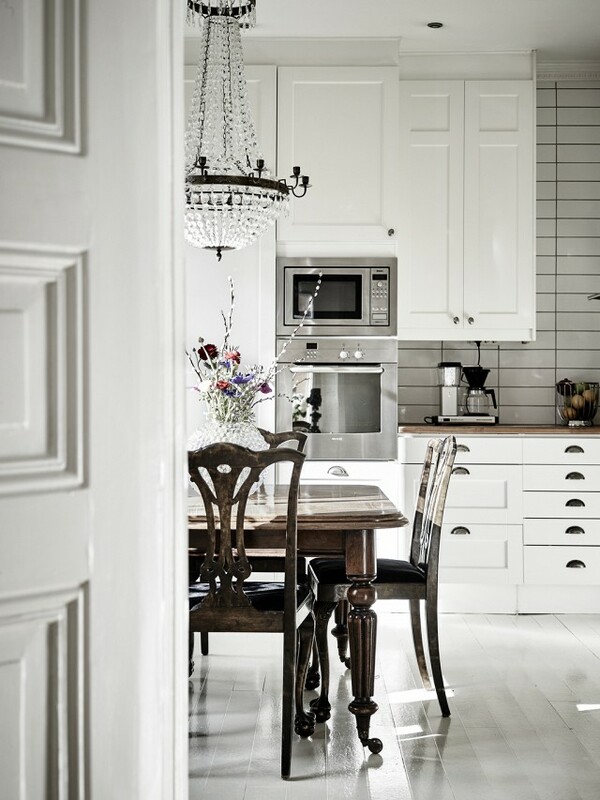 so far, we have installed the one from sweden in my closet and two sconces in the master. i ended up using an antique silver chandelier from our previous home in the kitchen because i grew attached to it, and i'm so happy i didn't leave it behind! we even have a 1920s ceiling light from our very first home where we made so many happy memories. yep. we like our lights old! 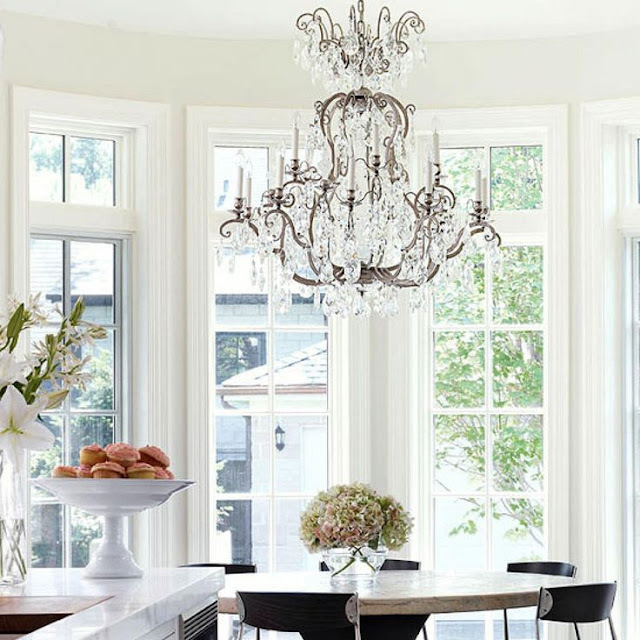 In my old house, there are crystal chandeliers in the living room, dining room, master bedroom/bath, guest room, and laundry room—plus a couple stored in the attic. I've never had one in the kitchen, though; afraid I probably wouldn't clean it often enough. 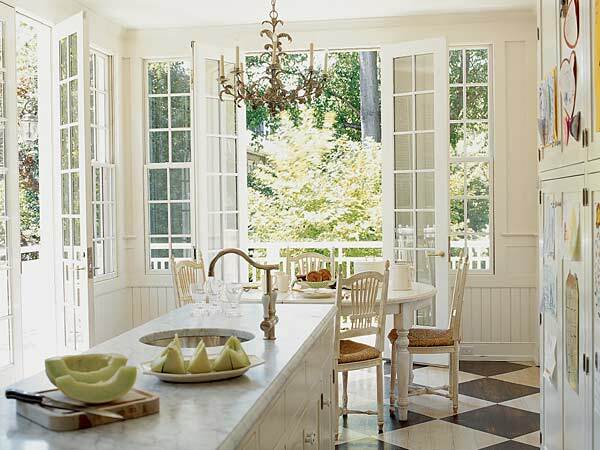 Those are some mighty fabulous kitchens for inspiration. I'm sure your new chandelier will be fantastic! I've got two in my basement that need to be rewired. I would like to hang the brass one in my kitchen but I think my ceiling is too low. Dang it! Loving the transition of your home - as it becomes you. Wow, stunning inspiration photos! I love them all. I like you just love them whether they are vintage or great repros. But what a beauty you found. I actually picked up a brass one a couple years ago, painted it off white and had hopes of hanging in our spare bedroom in the basement. It's been in our furnace room and I had forgotten all about it. lol! Looks like a project for hubby. Speaking of hubby, yours was a gem to give you a special gift like that. Can't wait to see it hanging in your home. So happy to meet you and thanks for sharing with Share Your Cup. Oh, and why do you have to take down the gallery wall if you put the light up? 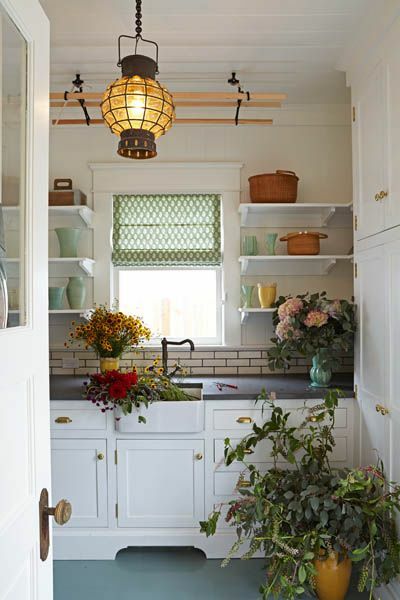 I absolutely adore that fixture for your space Leslie. You have such an eye. I can't imagine a more perfect choice. Your hubby must think like mine. Mine is always happy to buy an antique but anything else...not so much! 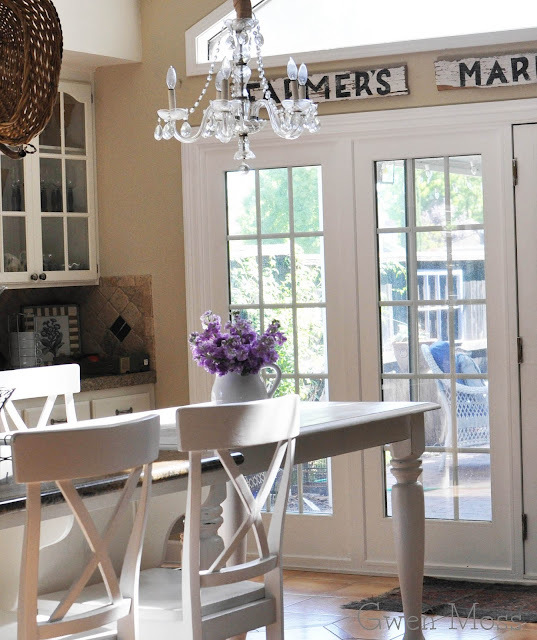 That chandelier is going to look gorgeous in your kitchen and provide nice lighting, too, Leslie! What a wonderful gift!